I was really looking forward to making a sweet potato pie this week for Fall Fest. I’ve never made one and I’m pretty sure that I’ve never even tasted a sweet potato pie. Yes, it’s a shame, and I’m hoping to remedy the situation soon. But you may have noticed that I have been baking (and eating) a lot of desserts lately. And after yesterday’s amazing Praline-Pumpkin Cake, I just couldn’t bring myself to bake a pie. I need a break from sweets! I’ve found that I really prefer savory sweet potato dishes to sweet ones anyway, so this warm and spicy sweet potato hash is right up my alley. I kept it really simple – onions, sweet potatoes, and a few choice spices. You can certainly gussy it up with more stuff if you wish, but I really loved the way these turned out. Enjoy! Heat a large skillet over medium to medium-low heat. Add olive oil and butter and swirl around pan. 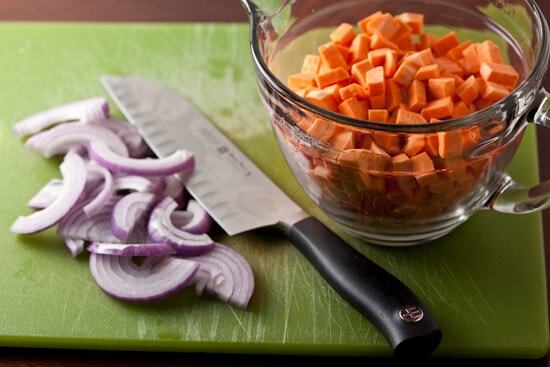 When butter is melted, add sweet potatoes, onions, and a generous pinch of salt. Cook, stirring occasionally, until potatoes are tender and starting to brown, 15-20 minutes. Once potatoes are tender and lightly browned, sprinkle in the cumin and smoked paprika and cook, stirring, for another minute. Add a pinch of crushed red pepper, stir, then season with salt to taste. Remove potatoes from heat and stir in parsley or other fresh herbs of your choice. Serves 2 – 3. 8/18: Stone Fruit – I missed this one! 10/13: Pumpkin + Winter Squash – I missed this one! « Ghirardelli Hot Fudge Blondie Sundae and a Giveaway! Oh my goodness, I love savory sweet potato dishes and this looks incredible :) Throw some chorizo in the mix and plop a fried egg on top and you've got one killer brunch! Mmm this sounds like an awesome side dish! yum! i prefer sweet dishes over savory, but this looks delicious! Nicole, this looks incredible! I love the addition of cumin here. Hmm... savory or sweet sweet potato dishes. It's so hard to pick which one I like. I don't have any kids but it's probably like trying to pick your favorite ;) Oh well, I am an equal opportunity lover when it comes to food. This looks great! It looks like something you could even wrap up in a tortilla and eat on the go as a wrap. Yum! This looks great. I will definitely have to make it for my husband. Thanks! Nicole this is heavenly. 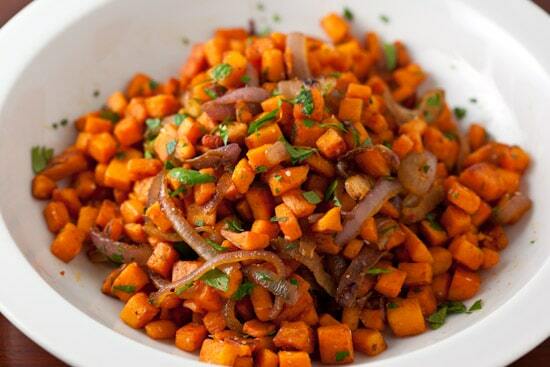 We ADORE sweet potatoes and I'm picking up some next trip to the market just to make this hash! Swoon! I second the egg on top idea - I'd do my poached rather than fried though. Might have to try this soon! That sounds just wonderful. I love savory sweet potato dishes. That looks totally delicious! I have to make it! I don't usually care for sweet potatoes, but that looks amazing! Nice. I'm down to give this one a whirl. I have just started cooking things with more than 2 ingredients, and this was delicious and super easy to make. I paired it with cornbread actually crumbling the cornbread over the hash and it was great! Thanks.